The motto of NCC (National Cadet Corps) says Unity and Discipline and cadets no matter what perform at the peak of their endurance and diligence to attain Unity and Discipline. This is what the intense drill training, ragadas, firing, tent pitching, line area, NIAP, weapon training, map reading, cultural performances and many such enduring activities in the camps train them for! KCT does all it takes to encourage and support the cadets’ patriotism, passion, commitment and dedication to be a part of the Second Line of Defence. The NCC of KCT has an Army boys wing, Army girls wing, and Air wing who do fantastic work round the year. 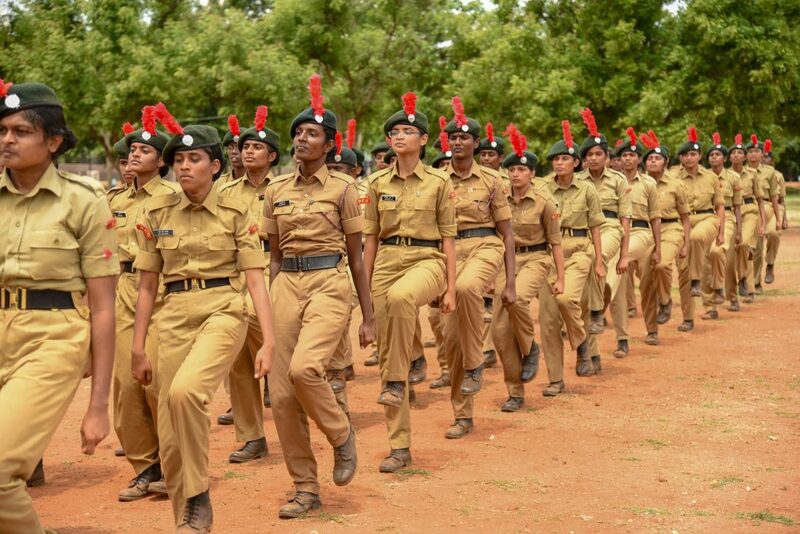 Now in KCT is taking place one such camp from 18 – 28 June put up by 5 TN Girls Battalion, Coimbatore group. Combined Annual Training Camp (CATC) and Thal Sainik Training Camp (TSC). 518 cadets from 13 schools and 17 colleges are camping in Kumaraguru campus. It’s a great sight for any trespasser to see the cadets practice drill, hear the uniform sound of their foot, ‘Left Right Left, Left Right Left’ and feel a rush of blood with the knife sharp left and right turn they do at the command of their Parade Commander ‘Dhinae Moad, Bhayae Moad’! How does a day in NCC camp site look like? Activities such as drill, weapon training, Map Reading, Field Craft, Judging distance, besides lectures on Health and Hygiene, First Aid, Ecology and environment, Disaster Management, Civil defense, Organization and Role of NCC, Duties of citizen and Social Service are carried out in the camp. Cadets and the training officers would wake up as early as 5 o clock and in no time you could find them standing in their contingent fully dressed in their prestigious uniform ready to practice drill. This session would extend to three liberal hours with minimalistic breaks say for a minute or two. It may sound hard while reading it now, but any cadet would it the best period. I am sure if you are an NCC cadet you agree this big time! In the drill contingent if a cadet misses the beat or the salute, who gets the ragada (punishment)? The whole contingent! Most times! And no team building activity can fetch this result in building a strong team. 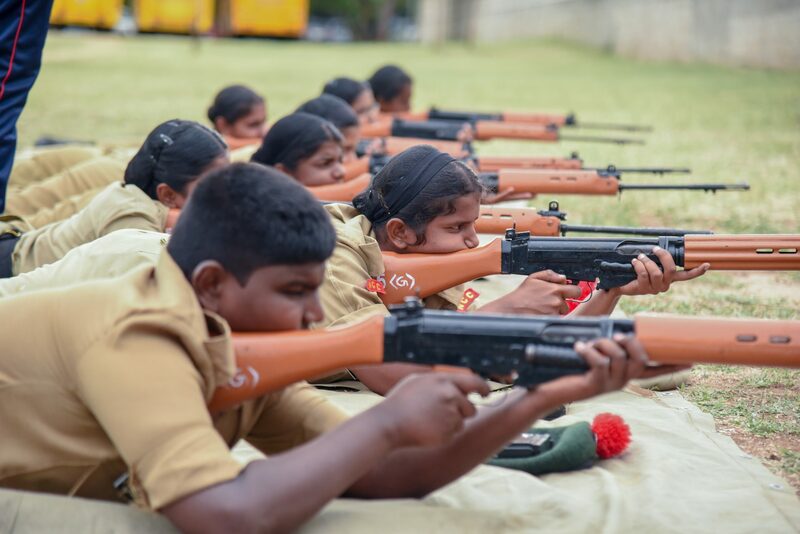 They allow themselves to get trained to attain their final march in the Republic Day Parade. Their Parade will end on 26th January but not the disciple an integrity they learnt. So, after good long amount of drill training, cadets take up weapon training, certainly after their breakfast. They learn to handle and clean the SLR, the Self Loading Rifle. 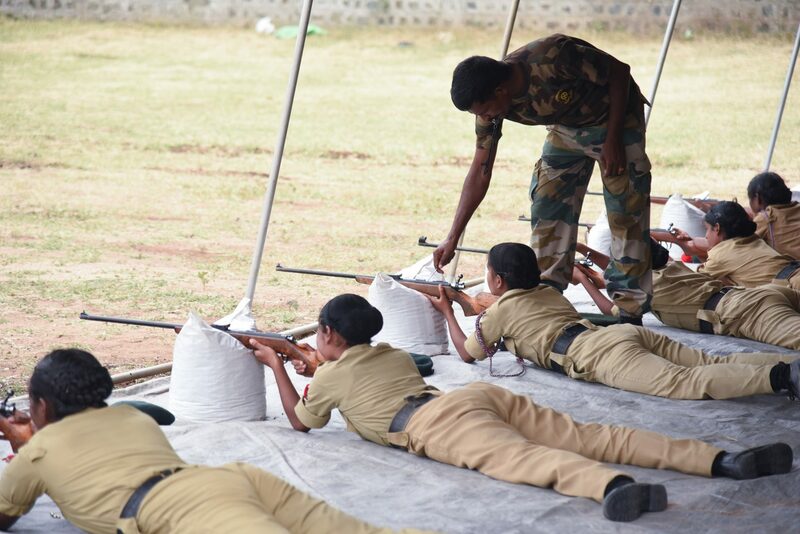 The Senior Wing cadets handle 7.62 mm rifle and 0.22 mm sportive rifle for the Junior Wing cadets. Followed by this would be sessions on Health and Hygiene, Signal Communication, First aid etc. Cultural performances are as important as drill and weapon training as they would be representing Tamil Nadu, Pondicherry and Andaman Directorate in the National Level Camps. In all their cultural performances such as folk dance, classical dance, classical song and ballet they will represent the Tamil region’s culture. So, all evenings are dedicated to this. The last few days of the camp is when the cadets and contingents compete in competitions like Drill, Weapon Training, Group Song, Group Dance, Solo Song, Solo Dance, Essay Writing, Poster Making etc. This is a very limited representation of an NCC camp. It is very intense and enduring. Talk to an NCC cadet, you will be amazed!